Order now wile quantities last! Advantages overwintered nuc’s are you get at least one extra brood cycle in the spring build which is huge! Higher chance of a greater honey flow these units will definitely produce honey on the first year! 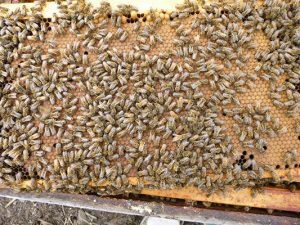 Nucs consist of 4 frames, including 3 frames of all stages of brood and bees with a young, well established mated queen, and 1 frame of honey / pollen. Comes in a waxed dipped cardboard nuc box. Optional: Upgrade your waxed dipped cardboard nuc box, to a ventilated hard corrugated plastic nuc box, for longer transportation length for an additional $15 each.